Kitty loves this and she continues to play with this even after purchasing it several months ago. It has deterred her from using the furniture as a scratching post instead. The game inside she mastered right away and the balls are now under the couch somewhere. Care Instructions: Spot clean soiled areas with mild detergent or soap. Blot rinse and air dry. Dimensions: 16" x 16" x 22.5"
Dimensions 16.0 In. X 16.0 In. X 22.5 In. This is our first cat & first cat tree! I looked up and down the site for hours and this was the best fit! We LOVE it and so does our kitty. The height is perfect and she loves to bat at that hangy ball while sitting on the top! I only give 4 stars because i feel like, although sturdy, it could be a little bit more sturdy. and she can get the balls out with her nails through the top.Missy doesn't have any issues with it though! its like a whole new game! I would definitely recommend this over others! My cat love this scratching post. However, the treads on the post wears away quickly. My cat is only 6 months old so if he was older it would probably wear away even faster. This is my first cat so, I am not sure what’s the real normal for these kind of toys. My cat loved this from the moment we set it up! Took her about 2 minutes to figure out how to get the balls out, but she really likes the scratching post! The cats like this and play and sit on the top shelf. They use the scratching post too. Glad I purchased it for them. My "Kitteh"... she loves loves loves this! Many hours spent playing on it... so fun to watch her and get silly antics that this toy/ scratching post brings out of her! Highly recommend! A must have for all kitties! my 4 cats are so amused with this post. They especially like finding the little balls inside the circle. There is always a dominant cat sitting on the top, but amazingly, they do share the top sitting quarters too. Highly recommend this product. The scratcher is great. I was excited to assemble the Tiger Tough Cat Playground, but it broke as I was assembling it. I do not recommend this "cat playground" it is very light weight, my cat weighs more than it does!! It was very easy to put together, but it is not meant for adult cats. I was looking for something my cat could perch on or lay on. This is so wobbly, when the cat tries to jump onto it it wobbles over. the top and bottom platforms are so thin, and light weight it is very unstable. Kitten loves this item. Easy assembly and is sturdy - I would definitely purchase again and recommend it highly. Very colorful as well. Large platform on top for my kitten to lounge. Very well made would definitely recommend. I have a wild child and it has withstood his playfulness. Great quality and very easy to assemble. This is a smallness space conscious kitty playground. It is perfect for kittens. Mine spend long times chasing the ball through the busy box and love the jingle sound the ball makes. Doesn't take up much space and our kitten loves it! "what are the dimensions of the TOP Perch?" I'm not sure of the dimensions as I bought mine for my son but I do know it's large enough for a full size cat. I was very pleased with this! Because I have 4 cats. I hope cats will be busy playing with this one. 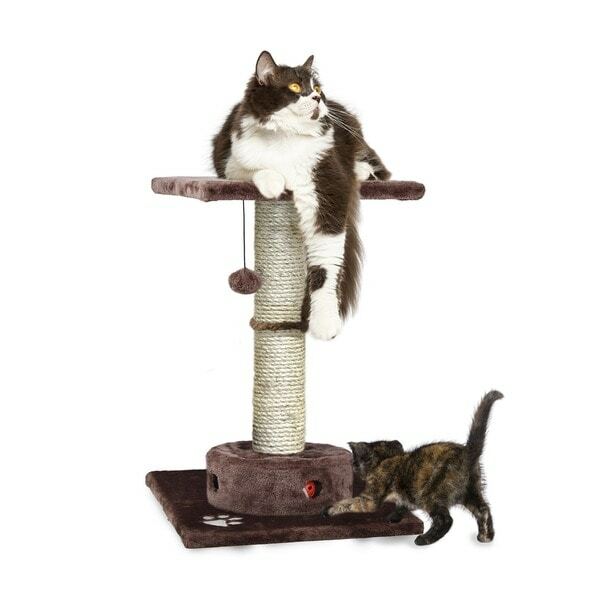 is the purr-fact scratching post and perch for your kitten or cat! With natural sisal for clawing integrated into the design, this small cat tree is also an interactive playground for your pet. The Cat-IQ Busy Box base features two jingle balls for a fun game of cat-and-mouse. The top perch is great for lounging and also features a spring-loaded ball for batting and more play. Easy assembly in just minutes with included instructions.